Iron is an abundant and ubiquitous element on our planet and plays important roles in a wide range of biological processes. It is not only essential to our human’s body but also often involved in the secondary metabolism (natural products biosynthesis) in microorganisms and plants. 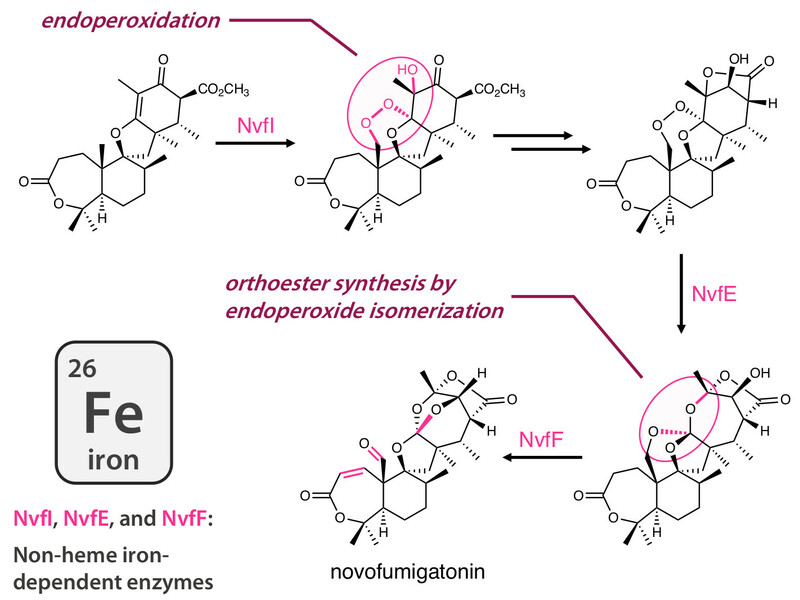 Either in a form of heme or non-heme iron, iron serves as an essential factor of many different classes of enzymes, which catalyze versatile chemical transformations. In recent years, we are witnessing an increasing number of iron-dependent enzymes utilized for interesting reactions. We were interested in the fungal natural product novofumigatonin, which harbors a unique orthoester moiety. Despite its intriguing molecular skeleton, however, the mechanism for the orthoester formation remained mysterious. To elucidate the biosynthetic pathway of novofumigatonin, we initially performed gene deletion experiments on the putative biosynthetic gene cluster of the compound and consequently isolated and characterized a series of metabolites expected to be a pathway intermediate or shunt product. What surprised us was that two obtained compounds were found to possess an endoperoxide linkage, which we have never considered as biosynthetic precursors of novofumigatonin. Actually, because of this unexpected result, we could not easily believe the structures at the beginning, which attempted us to synthetically derivatize them for further structural confirmation. Subsequently, an in vitro enzymatic assay revealed that an Fe(II)/α-ketoglutarate (αKG)-dependent enzyme NvfI is responsible for the endoperoxidation. So how can this endoperoxide be transformed into the orthoester in novofumigatonin? We next focused on NvfE, which was also predicted to be an Fe(II)/αKG-dependent enzyme, as the catalyst for the orthoesterification. Enzymatic reaction of the purified NvfE with one of the endoperoxide metabolites successfully yielded a new product with an orthoester moiety, but here was another big surprise; the orthoester of the product is different from that of novofumigatonin. Another Fe(II)/αKG-dependent enzyme NvfF then accepts the product from the NvfE-catalyzed reaction to perform two round of oxidative reactions, including transorthoesterification, to complete the biosynthesis. Further biochemical characterization of NvfE intriguingly revealed that NvfE does not require αKG, despite its sequence similarity to known αKG-dependent dioxygenases, probably due to the mutation found in the αKG-binding site. Thus, it seems that NvfE has completely lost the function as a dioxygenase but instead acquired an endoperoxide isomerase activity to generate the orthoester functionality, and therefore, NvfE belongs to a new class of isomerase utilizing Fe(II) as a cofactor. Our present study established the complex biosynthetic route to novofumigatonin and shed light on the enigmatic mechanism for the orthoester biogenesis. Actually, we have previously proposed a possible mechanism for the orthoester synthesis1, but very embarrassingly, our proposal has now been proved to be completely irrelevant. Nevertheless, we see this in a positive manner, since it reminds us that nature’s synthetic strategy is full of unexpectancy and that many exciting enzymes and reactions have yet to be discovered from natural products biosynthesis. 1. 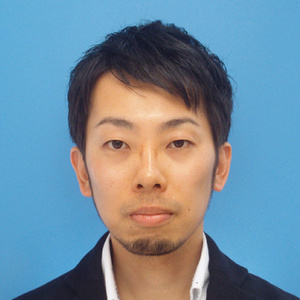 Matsuda, Y. & Abe, I. Biosynthesis of fungal meroterpenoids. Nat. Prod. Rep. 33, 26-53 (2016).